My virtual travel via cookbook reading has now taken me to Central Asia into Uzbekistan and the surrounding areas. I was intrigued to learn more about the food from this part of the world, and a review copy of the new book Samarkand: Recipes and Stories from Central Asia and The Caucasus made that possible. Samarkand is a city along the Silk Route in the Zerafshan River valley in Uzbekistan where trade brought immense prosperity from the sixth to the thirteenth centuries. Trade also brought a mix of cultures and cuisines, and the book includes dishes from the different ethnic groups that have influenced this city’s food. There are strong similarities to Turkish food but also elements of Russian and even Korean. A variety of spices are used for flavoring dishes but not to add heat, and herbs and fresh and dried fruits are used frequently. There are several fresh vegetable dishes in the book like a salad of Radish, Cucumber, and Herbs made with scallions, cilantro, and dill and Walnut-Stuffed Eggplant Rolls with pomegranate seeds, mild green chile, and garlic. Among the hearty soups, I’m most curious about the Apricot and Red Lentil Soup with cumin seeds, thyme leaves, lemon juice, and dried apricots. One chapter is devoted to Roast Meats and Kebabs and another to Plovs and Pilafs. Plov is a layered pilaf popular throughout the region. It’s a celebratory dish that represents “hospitality, community, and identity.” One of the pilafs I have to try is the Pumpkin Stuffed with Jeweled Rice which involves partially cooked rice with dried fruit, orange blossom water, saffron, sliced almonds, chopped pistachios, and spices that gets spooned into a hollowed and partially cooked pumpkin to finish cooking together. And, from the Breads and Doughs chapter, I did try the Kyrgyz Swirled Onion Flatbread. I was amazed to find the process for forming these flatbreads to be the same as that of making the Scallion Flatbreads I learned in a class taught by Grace Young. (The recipe is also found in her book The Wisdom of the Chinese Kitchen.) Rather than using scallions and sesame oil, here onions were caramelized in butter and spread on flattened dough. Circles of dough were rolled into ropes, twisted into spiral shapes, and then rolled flat again to disperse the onion filling throughout a flattened dough round. The rounds were then cooked with just a little oil in a hot skillet and were crisped on the surfaces and deliciously chewy in the middle. The other dish I tried was fresh and bright for summer with zucchini, yellow squash, and lots of bright flavors. 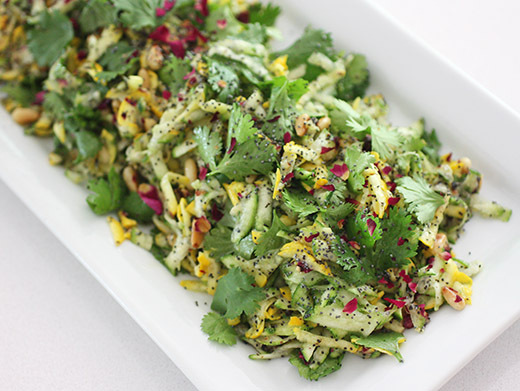 The Grated Zucchini with Pine Nuts and Poppy Seeds salad was easy to put together once all the ingredients were gathered. First, I tried to track down dried rose petals. Our Middle Eastern grocery store would normally have them, but they were out the day I was looking. I ended up using dried whole rose buds intended for tea, and I snipped off the stem end and loosened the petals. Pine nuts are easier to find, and they were toasted and cooled before being added to the dish. Ground sumac is also easy enough to locate these days, and it adds a lovely, lemony flavor. I used a mix of green and yellow zucchini from the farmers’ market, and they were grated into a big bowl. Poppy seeds, the toasted pine nuts, dried rose petals, zest and juice of a lemon, olive oil, ground sumac, cilantro leaves, and salt and black pepper were added, and the salad was served. The salad was crunchy, lemony, and so pretty with the mix of colors. And now, there are so many more flavor combinations I look forward to trying from the book. The Grape and Pistachio Orzo pasta salad with basil and Green Beans with Hazelnut Tarator are two I’m eyeing. When I can’t jump on a plane, virtual travel through food is the next best thing. Recipe reprinted with publisher’s permission from Samarkand . 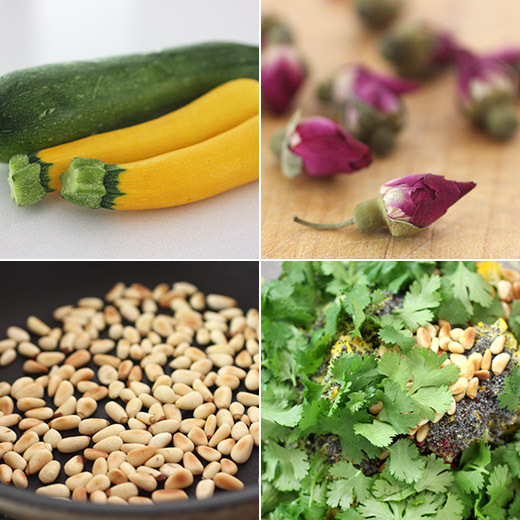 Raw zucchini has a pleasing crunch and nutty flavor that pairs well with the sweet taste of poppy seeds and pine nuts. 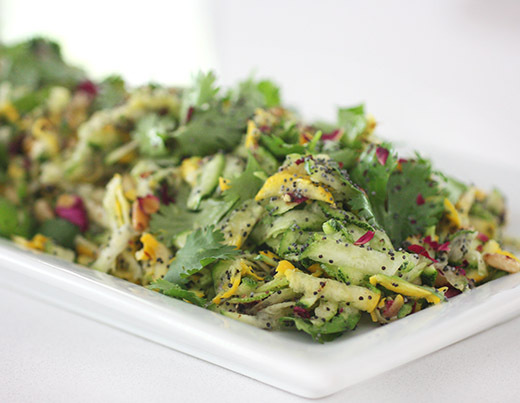 In summer, a mix of green and yellow zucchini looks lovely with the pink rose petals. Coarsely grate the zucchini into a bowl using a box grater. Toss with the remaining ingredients and season with salt and pepper. An extra pinch of salt flakes over the top is good as well. Serve immediately (it will soon get watery). A fantastic salad and combination! Right up my alley. A very creative and delicious combo of flavour! What a savory idea for the end of summer zucchini glut. Love the easy prep in this recipe with so many intriguing flavors! I have to admit I don't know much about the food of Central Asia really. But the dishes you mentioned and this one do sound and look really good! What a co-incidence! You mentioned 'jeweled rice'-I just attended a food demonstration by an Iranian woman on 'Jeweled Rice with Chicken'. It's great opening up our food consciousness from other cultures! What a gorgeous salad! I'm so interested in that part of the world - it seems like it's just opening up. Thanks for letting me know about this terrific cookbook. Love this salad! So perfect for the season. And there's such an interesting world of food out there, isn't there?